For reasons that still remain unclear to me (although I’m pretty sure my mother has something to do with it) one of Shaun’s greatest joys in life is to torment me and try to “get my goat” as he calls it. I’ve always been pretty good at ignoring him. (If you know my mother, you understand how I developed this survival skill) If you don’t know Shaun, let me just tell you that saying he can be very obnoxious and annoying would be an understatement. Much to my amusement, people are forever telling me what a wonderful, patient saint I am. What they don’t understand is that…well…I kinda likes him that way. (But please don’t tell him that, it will only encourage him more) I have to admit that I have a bit of a short attention span, and living with Shaun keeps things lively. Nobody can ever say that life with Shaun is boring. Usually all of his naughtiness is out in plain sight. Sometimes though, we have these long, unspoken battles. Currently, it is about the Q-tips. A couple weeks ago he bought a package of them at the grocery store. (Which I hate…he knows that Q-tips are supposed to come from Costco) along with some groceries and plopped the whole bag down on the kitchen floor and left them there. They sat there for a little while until I came along and put the perishables away grumbling the whole time. I temporarily placed the Q-tips on the counter. I have to admit that I can be a little dense sometimes. I didn’t even realize that we were having a silent battle until I watched Shaun come out to the kitchen wrapped in a bath towel and grab a couple of Q-tips this morning. Then he turned around and nonchalantly walked back to the bathroom to finish up his morning toiletries. Hunh. I guess I’ve pretty much been doing the same thing without realizing it. I can only wonder how much longer this will go on. 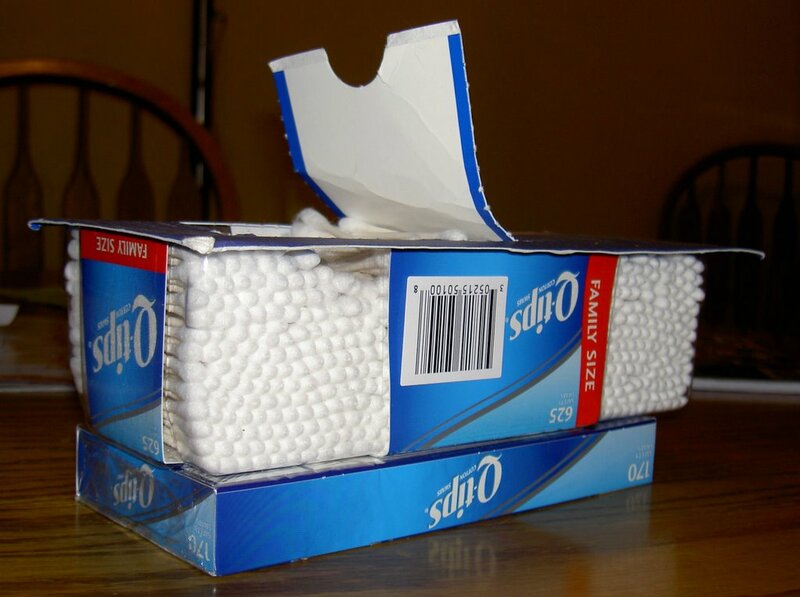 Will we use up all 625 Q-tips? Will we use the 170 count bonus pack as well? Or, will one of us (most likely me) take the higher ground and actually put the package away where it belongs? Hmmmm…. This entry was posted in Love and Marriage. Bookmark the permalink. ROFLMAO! Same thing goes on in my house, its all in love. I think you should put them in the freezer.